Candlewick Press, 2017. 94 pages. I have always loved fairy tales. My grandma owned several of the various-colored fairy tale books by Andrew Lang, and I remember sitting in her big comfy chair and reading them when I was quite young. This is a 2017 book, but our library purchased it in 2018. When my hold came in, I saw the copyright and was going to turn it right back in – I’m reading for the Newbery, and I don’t have time for anything else. However, intrigued by the title and the look of the book, I opened to a random page. The tone and spirit of the tales captivated me quickly. I brought them home, figuring that reading one little story each day wouldn’t hurt anything. And I really did get it read that way (which is surprising right there). At the end I cheated a little and read two stories in one night. On one side of this frozen forest stood a castle. In it lived a queen who was unhappy. She was a warm person, a bright person. Her husband was chilly and dull. It had been a mistake to marry him. When their first and only daughter was born, the king named the baby Snow White. The queen would have preferred a name like Tulip or Sunshine. An Author’s Note at the back gives her philosophy of retelling these stories. She wasn’t trying to be accurate to originals or entirely reinvent the tales. What I’m doing instead is telling these stories largely faithfully, but without adhering to versions made famous by Charles Perrault, the Brothers Grimm, and others. I wrote them simply as I myself want to tell them, using the storytelling techniques I have at my disposal. After all, before people began writing them down, these tales were passed down orally. They changed a bit with each new teller. I wrote to bring out what’s most meaningful to me in the stories, and in that way I believe I am part of a tradition that goes back to the earliest tellers of these tales. The result is delightful. These would be fun to read aloud at bedtime to a child or after lunch to a classroom. Now, some kisses break enchantments. And other kisses begin them. You’re going to find both kinds of kisses in these tales. HarperAudio, 2017. 6.5 hours on 6 compact discs. Unabridged. I could listen to Neil Gaiman read the phone book! Although I ended up finding Norse mythology quite strange and wild – I can’t imagine a better way to hear these stories than read by Neil Gaiman. And written by Neil Gaiman doesn’t hurt, either. He captures the magical and mystical feel of the tales. There’s an explanation at the beginning about Asgard and Midgard and the Land of the Giants and all the rest – It might have been simpler if I’d had that explanation in print to refer back to. Anyway, this way I was caught up in the stories. Most of them had Loki being a trickster and Thor throwing his hammer around to get his way. There are many stories in this collection, and many of them have more than one chapter. There’s a dizzying array of characters, though usually Neil Gaiman refers back to where we have seen an obscure character before, so it seems quite coherent. We do learn how Thor gets his hammer and what powers it has. And we find out about many adventures of the gods and goddesses, which so often start by an action that wasn’t terribly wise. And then there are consequences. And gods and giants try to trick others and are tricked themselves. And most of the stories were not familiar to me like Greek myths, so they were all new adventures. 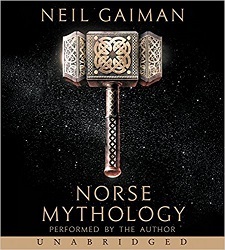 That review seems a little coherent, but here’s the bottom line: Norse mythology explained and retold by Neil Gaiman, and even read by Neil Gaiman. Now that’s worth listening to! Hachette Audio, 2016. 7.5 hours on 6 CDs. Unabridged. 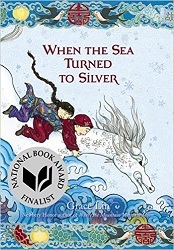 Like Where the Mountain Meets the Moon and Starry River of the Sky, Grace Lin weaves Chinese fairy tales throughout this story, bringing elements from the various tales into the conclusion at the end. It’s okay if you haven’t read or don’t remember the other two, as this story stands well on its own. The audiobook includes a pdf file of the illustrations, but I chose to check out a copy of the print book so I could enjoy them as I went. Each day after my commute, I’d look at the pictures as far as I’d gotten in the audiobook. Grace Lin is an illustrator as well as a writer, and this book includes color plates at intervals, and small one-color illustrations at the start of each chapter. This book is a treat to hold in your hands, and would make a wonderful read-aloud. At the start of the book, the evil emperor comes with his soldiers up the mountain, during a winter that has lasted far too long, and takes away Pinmei’s grandmother, the Storyteller. When the neighbor boy Yishan protests, the emperor tells him that they can have the Storyteller back if they bring the emperor the Luminous Stone that Lights Up the Night. The soldiers set fire to the hut and leave, but Yishan rescues Pinmei from her hiding place, and the two travel together to try to find a Luminous Stone and save Pinmei’s Amah. Their adventures take them to the City of Bright Moonlight and the kingdom of Sea Bottom. Along the way, Pinmei tells stories she’s learned from her Amah – and those stories provide clues to what the emperor is looking for and how to thwart him and get Amah back. This book has a theme of immortality, the importance of stories, and finding your voice. At the start, Pinmei is too shy to even speak in the presence of others, but by the end, she can speak truth even in front of the emperor. 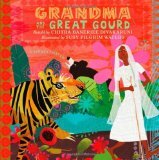 This book would make a wonderful family or classroom read-aloud. The fairy tales woven throughout give it a timeless appeal for a wide age range. Arthur A. Levine Books, 2016. 185 pages. This is a book of art. But all the art is based on fairy tales from the Brothers Grimm. 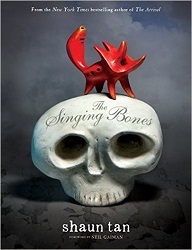 Shaun Tan has created sculptures based on the tales. On each spread, there’s a short excerpt from the featured fairy tale on one page, and a photograph of the sculpture on the other page. The main materials I’ve used are papier-maché and air-drying clay, carved back and painted with acrylics, oxidized metal powder, wax, and shoe polish. The resistance of clay in particular at a small scale encourages simplicity, especially where the key tools are blunt fingers and thumbs: Faces and gestures are abbreviated, just like characters in the tales themselves. The concept of a thing also becomes more important than a detailed likeness: A fox need only be a few red triangles, a sleeping man requires no body, and a queen’s face can be eroded away by the force of a single, elemental feeling: jealousy. What matters above all else are the hard bones of the story, and I wanted many of these objects to appear as if they’ve emerged from an imaginary archaeological dig, and then been sparingly illuminated as so many museum objects are, as if a flashlight beam has passed momentarily over some odd objects resting in the dark galleries of our collective subconscious. Like the tales themselves, they might brighten in our imagination without surrendering any of their original enigma. Shaun Tan does something else here: something profound. His sculptures suggest, they do not describe. They imply, they do not delineate. They are, in themselves, stories: not the frozen moments in time that a classical illustration needs to be. These are something new, something deeper. They do not look like moments of the stories: instead, they feel like the stories themselves…. Here they gather for you, timeless and perfect, a mixture of darkness and light that manages to capture Grimms’ stories in a way that nobody, to my knowledge, has done before. Shaun Tan makes me want to hold these tales close, to rub them with my fingers, to feel the cracks and the creases and the edges of them. He makes me want to pick them up, inspect them from unusual angles, feel the heft and the weight of them. He makes me wonder what damage I could do with them, how badly I could hurt someone if I hit them with a story. All of Shaun Tan’s work is eerie, abstract, and creepy. But combining his images with timeless folk tales gives them whole new power. In short, you really need to see these images. Check out this book and take a look! Toon Graphics, 2014. 53 pages. This book is put out by a publisher of graphic novels and is in the size of a large graphic novel. But there are no speech bubbles here. What you do have are large double-page spreads of black-and-white (mostly black) very dark paintings alternating with double-page spreads of text. The pictures are dark and sinister, and the story is dark and sinister. Like all fairy tales, it has power. 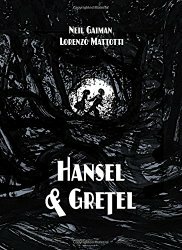 The word painting of Neil Gaiman combined with the art of Lorenzo Mattotti gives this familiar tale new impact. There was only one room in the little house, with a huge brick oven at one end, and a table laden with all good things: with candied fruits, with cakes and pies and cookies, with breads and with biscuits. There was no meat, though, and the old woman apologized, explaining that she was old, and her eyes were not what they had been when she was young, and she was no longer up to catching the beasts of the forests, as once she had been. Now, she told the children, she baited her snare and she waited, and often no game would come to her trap from one year to another, and what she did catch was too scrawny to eat and needed to be fattened up first. This story is far too sinister for the very young. Those who read this story will be confronted with evil — and children who triumph over it. Cinco Puntos Press, 2013. 40 pages. Here’s a charming story told in both English and Spanish, and one that’s worth telling in either language. Rosa and Blanca’s mother has always been proud of how good her daughters are to each other. When they grow up and each grow a garden, each wants to share her bounty with her beloved sister. First, when their tomatoes harvest in abundance, each sister goes to Mamá and tells her plans to share her windfall with her sister. Both sisters have the same idea, and they don’t even notice the other sneaking to their house in the dark. 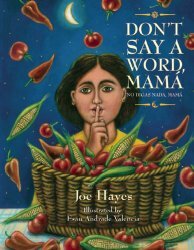 Mamá sees, but she’s sworn to secrecy. In the morning, when the tomatoes have mysteriously multiplied, each sister decides to give some of the overflowing tomatoes to her mother. The same thing happens when the corn is harvested. But when it comes time to harvest the chiles, Mamá decides that she may not say a word, but she will have to put a stop to the silly charade her loving daughters are carrying out. Because what will she do with all those hot chiles? This has the humor and charm of a tale worth telling, no matter which language you choose to tell it in. 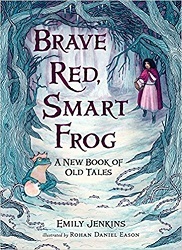 Frances Lincoln Children’s Books, 2012. 135 pages. I loved fairy tales when I was a child. This book contains stories in the fairy tale style that I’ve never heard before. Iran (often known as Persia in the west) is a land of stories. There are so many that they could fill hundreds of books and take years to tell. Some of the best of them are found in the Shahnameh, or “Book of Kings,” a very long poem which was written a thousand years ago by a great Persian poet called Ferdowsi. People in Iran, Afghanistan, Kazakhstan and all over the mountainous lands of Central Asia know the stories of the Shahnameh. They have told and retold them through the centuries, from one generation to the next. Professional storytellers recite Ferdowsi’s verses in tea houses by the roadside. Farmers relate them to each other as they rest in the shade of their fruit trees during the hot months of summer, and mothers and fathers tell them to their children as they huddle indoors round the fire in the cold of winter. Iranians love to hear about what happened at the beginning of time, how the first kings ruled in glory, how the great age of heroes dawned, how champions like Sam, Zal and Rustam rode out on their fiery horses to fight wicked demons, and how brave women, like Rudabeh and Gordafarid, conquered the heroes’ hearts. And that’s what you’ll find in this volume, tales of kings and heroes, battles, tricks, and love stories. I’m not crazy about the art, but the simple flat style suits the subject matter, having a look of primitive art from ancient times, as well as plenty of floral decorations. This book tells American children about folktales they may not have heard before. This is a nice collection of folktales most children won’t have heard before. Each one comes from a specific region and a specific indigenous people group of Mexico. After each tale, the people group who tells that tale is described, along with some facts about the region and the featured animals. Spanish and native words are woven seamlessly into the tales, but in case you didn’t catch every detail, there’s a glossary after each story. Where else in the world will you find a clever cricket who defeats a puma, a patient turtle who helps create the world, a brave opossum who gives mankind a wonderful gift, a flea who saves humanity, and a frog who, just in time, keeps his heart in his chest? Yet every culture in the world has tales that are important to its people. Like the stories in this book, all fairy tales and folktales allow people to pass along traditions and knowledge not only among their own community, but also to the world. Through stories we come to understand ourselves as well as the world around us. Perhaps the tales in Whiskers, Tails & Wings will encourage you to share your own stories, discover new tales, and maybe even create your own! A Neal Porter Book, Roaring Brook Press, New York, 2013. 32 pages. Here’s a wonderful folktale, marvelously told. The pictures are exquisite, giving the flavor of India. The story is sprinkled with sound effects that aren’t ones native English speakers would naturally use. There’s the repetition of a folktale, and a lovely predictability — with a twist. This is a book for school age kids, with the text on the long side for preschoolers. With that in mind, the telling is sure to engage their interest. Once upon a time, in a little village in India, there lived an old woman whom everyone called Grandma. She loved gardening and had the best vegetable patch in the village. Grandma lived by herself in a little hut at the edge of the village, next to a deep, dark jungle. At times she could hear herds of elephants lumbering on forest paths, thup-thup-thup, or giant lizards slithering over dry leaves, khash-khash. She didn’t mind because she had two loyal dogs, Kalu and Bhulu, to protect her. They also helped her with garden chores. Grandma’s heart went dhip-dhip, but she didn’t let the fox see how scared she was. “That sounds good!” said the fox, and he let her go. Of course, to get home after visiting her daughter, and indeed growing plump, Grandma must outwit the tiger, the bear, and the fox. Her plan works on the tiger and the bear, but the fox is more clever and confronts her. However, there’s a lovely satisfying ending, for which the groundwork was laid at the very start. This has all that’s good about a folktale, including being one you’ll want to tell again and again. Templar Books (Candlewick Press), 2012. 36 pages. Here’s a cinematic retelling of Jack and the Beanstalk set in what looks like 1930s America. Jack and his mom run a diner, but when a huge overpass is built, all their business goes away, and they’re down to their last few pennies. Jack’s mother sends him to buy some coffee beans, but then Jack meets a guy who looks like a bum under a city bridge who offers to sell him a can of magic baked beans. Now Jack had read enough fairy tales to know that you don’t turn down an offer like that. Also, baked beans were his favorite food in the whole world, so he couldn’t resist tasting some magic ones. Thanking the man, Jack exchanged his last pennies for the beans and ran home. You know how the story goes. This vine, instead of growing regular beans, grows cans of baked beans as it stretches high into the sky. But this story has all the unkind and unethical bits taken out. “We have visitors,” boomed the giant. “So I see,” squawked the chicken. “And we know just what to do with visitors, don’t we?” said the giant. “Now you STAY THERE. I’ll be back in a jiffy.” And with that the giant grabbed a handful of the chicken’s eggs and marched off to his kitchen. Soon the sound of clattering pots and pans was making the table tremble. “Is he going to eat us, Chicken?” squeaked Jack. I wasn’t surprised to read at the back that Colin Stimpson has been an art director and production designer for Steven Spielberg and Walt Disney Feature Animation, because these paintings look like stills from an excellent animated feature film. He uses light to highlight the action. He has incredibly detailed three-dimensional-looking backgrounds. This would work well as a cartoon short. But mostly, it’s just plain fun. The nice giant helps good-hearted Jack and his mother (and his ever-present dog) feed plain working folk. And everybody ends up happy. Did I mention the book is beautiful to look at? This book will leave you smiling. You are currently browsing the archives for the Folk Tales category.